Tipu Panel series is set of innovative indicators created to consolidate indicators in form of a panel. As a trader, indicators can easily create a cluster on the chart and distract you from the bigger picture. It can also be overwhelming and visually exhausting. Tipu Panel simplifies this by displaying each indicator in a beautifully boxed panel. 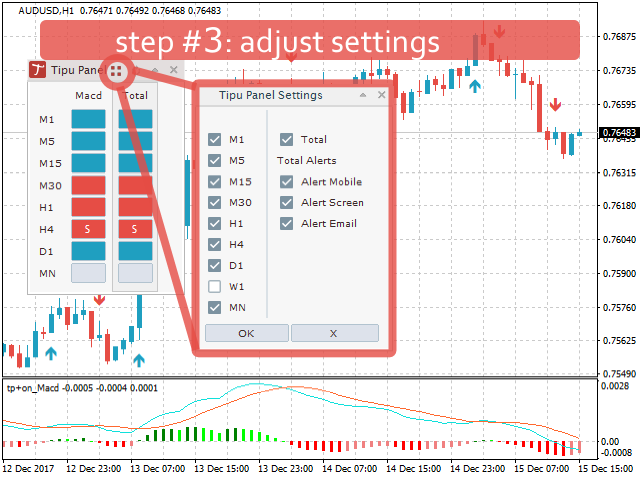 You can customize the panel to display indicator signals for multiple time frames and also to quickly switch time frames. 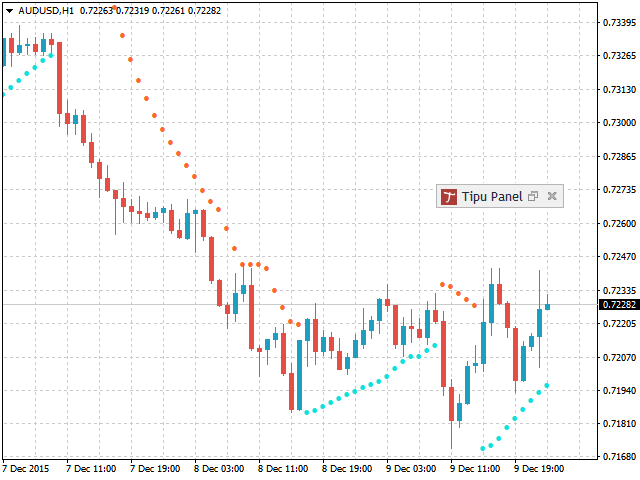 There are two types of indicators that make up the Tipu Panel series, the master indicator, and the add-in indicators. 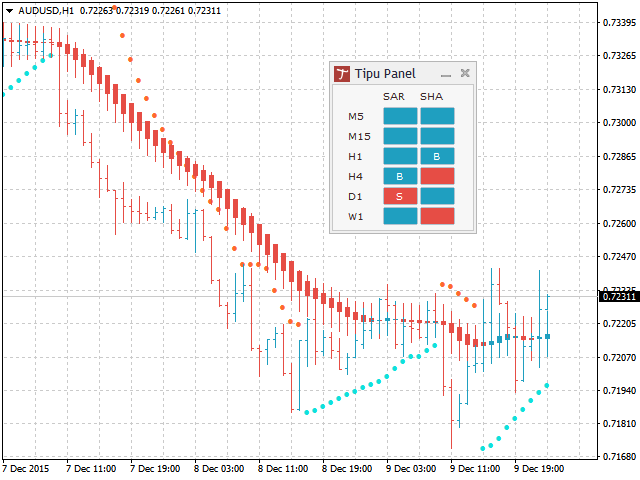 The master indicator (Tipu Panel indicator) plots a beautifully designed panel, and the add-in indicators feed the data to this master indicator panel. These two types of indicators work together for a faster, and efficient performance on the chart. 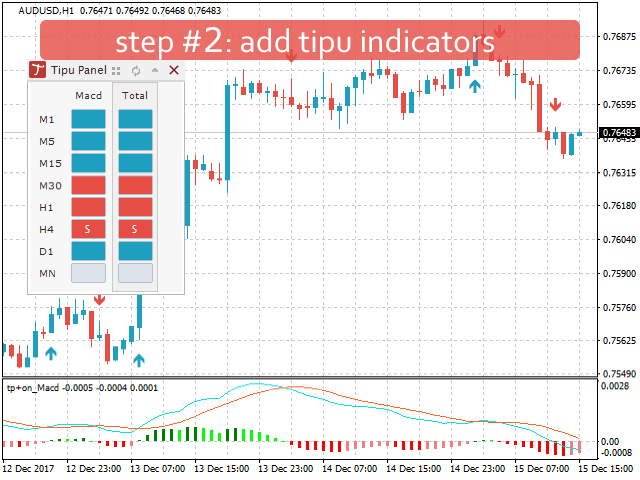 Tipu Panel is the master indicator that takes the data-feed from the add-in indicators. After adding the Tipu Panel indicator to the chart, you will see a blank panel with no boxes. You will need to add-in indicators to enable the panel. Tipu Panel is designed on the principle of multiple time-frame confirmations and can be used as a part of trend following trade strategy. According to the multiple time-frame confirmations strategy, higher time frames are used as confirmation and lower time frames are used for trading. For example, if you are using a trend following strategy on M15 (15 minutes charts), you may go long (buy) on a M15 signals, only if the trend is up on H1, H4, and D1. Tipu Panel makes trading simple by aggregating the indicators in one panel and showing multiple time frames for each indicator. You can also customize alerts in Tipu Panel settings so you can stay relaxed from staring at the computer screen for too long. Trend - Blue box mean the trend is up (this color can be customized in Tipu Panel settings), Pink box means the trend is down. Signal - “B” means a buy signal by the indicator, and “S” means a sell signal. The alert setting in the Tipu Panel indicator only controls the “Total” column. This column combines all the indicators signals and trend. For example, if all the indicators for a particular time frame change colors to blue (default buy color), then the “Total” column will change color to blue, and an alert will be sent for the change in trend. If the color is already blue and any one the indicator changes to “B” signal, then it will also alert for a “Buy” signal. 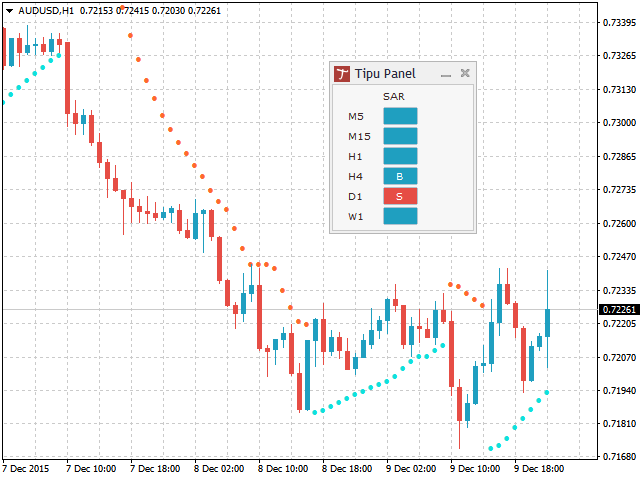 The alerts in the Tipu Panel add-in indicators control the alerts for the time frames enabled in the Tipu Panel indicator. For example, if you enabled M15, H1, and D1 time frames only in the Tipu Panel indicator, a Tipu MACD will give you an alert if there is a change in trend or a signal in M15, H1, and D1 time frames only. You may choose to disable alerts in all the add-in indicators and enable alerts in the Tipu Panel indicator only to get the consolidated alerts. You can control the additional setting by clicking on the settings button on the Tipu Panel. You can customize time frames to display and enable/disable alerts from the settings. Honestly, I am impressed! It's 4 stars from me but only because I hardly give anyone a 5. But you deserve one. If things continue this way, I will have to review my rating! добрый вечер, я купил 3 индикатора ( Tipu Trend , Tipu Impulse Oscillator , Tipu Parabolic SAR Dashboard ) паставил индикатор Tipu Panel alert приходит поздно , что мне делать ? как мне настроить индикатор. Thank you, it works well with all tipu indicators, 5 star from me. Good work. Great product. It works fine. Thank you! excellent and a thoughtful product! New in version 2.0. Updated user interface. The period and alert settings are now controlled by the dialogue directly. Fixed Alerts on symbol/period change from Tipu Panel, there will be no alerts in symbol/period changes from Tipu Panel. Reduced Margin for more room. 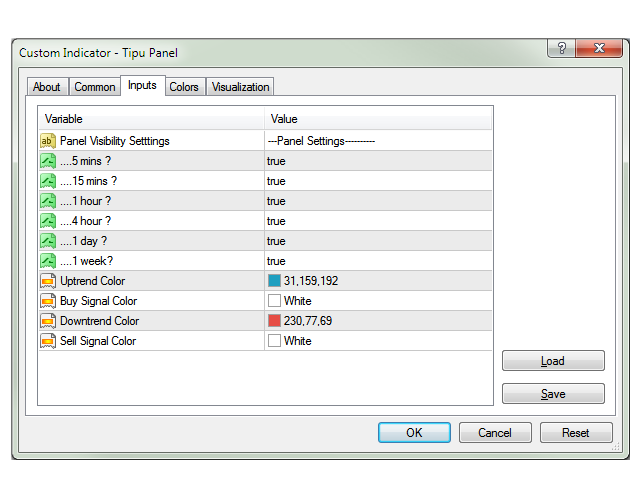 Tipu Panel supports up to only 6 add-on indicators. Fixed Tipu Panel crash when 7th add-on indicator is added. Added support for indicator values. For example, a user can choose to display RSI value on the panel instead of the buy/sell signals. Added "Total" column for all the add-ons. Users can now choose to display alerts when all the add-on indicators are aligned. Added support for all time frames (except month). New Feature Added: switch symbol+period by simply clicking the trend boxes on the panel. Added support for lower studies indicators. These are the indicators that show in subwindows. e.g. Tipu CCI. Fixed issue with loading templates. Click on the refresh button if add-on do not show up after loading the template.